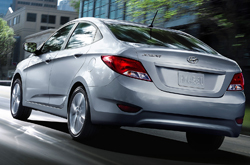 The Hyundai Accent is a smart, stylish and fuel efficient subcompact that Texas drivers have flocked to for years. This model year, the Accent is getting a slightly refreshed exterior design, new interior choices and several upgraded tech amenities. 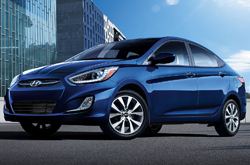 Economy car shoppers in Texas will have their choice between two body styles on the 2015 Hyundai Accent in Carrollton: sedan or hatchback. Our favorite option is the hatchback, which offers the most equipment and the best driving feel. The two trim levels offered on the Accent hatchback are the GS and Sport models. The Sport, formerly known as the SE, is also a favorite option of our 2015 Hyundai Accent review as it offers sportier features that match the fun hatchback-style of the Accent perfectly. Features on the Sport trim include 16-inch wheels, heated side mirrors, a sport-tuned suspension and foglamps. Other standard equipment includes an audio system with satellite radio, air conditioning, remote keyless entry and a reversed-color LCD screen. Also look for the interior to offer several new fabric choices as well. 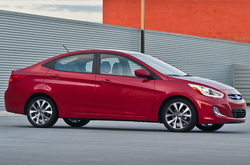 Minor exterior enhancements make the 2015 Hyundai Accent a very handsome option for subcompact car shoppers. The new Accent sports a new grille design, updated headlamps and a sportier taillamp design. It also gets slightly refreshed wheels. Fuel economy on the 2015 Accent is also terrific with the Accent getting some of the best fuel economy in its class, even with its manual gearbox, which offers a unique option of an "eco" shift light that helps you learn to use less fuel as you shift. Choose the automatic transmission option and you'll get an ActiveEco button that helps trigger early upshifts, which improves gas mileage immensely. The 2015 Hyundai Accent is now in Carrollton, so stop by our showroom and check out this excellent subcompact car today! Keep reading our 2015 Hyundai Accent review below to see exclusive pics and a video review. We're certain that the Accent is the best match for you. 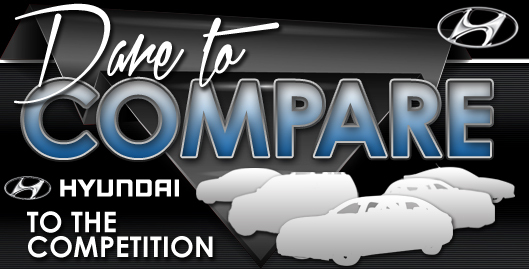 That's why we would like you to compare Hyundai's most current model against the 2015 Ford Fiesta, Mazda2, Nissan Versa, Chevrolet Sonic and the Toyota Yaris. You'll be pleased with the Accent's long list of terrific qualities, including its low cost and state-of-the-art cabin features. It's a truly amazing value, which you'll undoubtedly see when comparing its price to the aforestated list of vehicles. Find out more details about what it offers in our bullet list below this text! Thank you for reading our complete 2015 Accent review, written by Van Hyundai's professional authors. Good reviews are hard to find ; but as the well respected Hyundai dealership in Dallas we've put it all in one location for you. You can trust the information in this article to be up-to-the-minute and provide you with the details you need to [decide] if you want to take home the Accent. After reading through our review of the Accent, find out about current lease offers that'll help you save a substantial amount on your purchase at our Hyundai dealership in Dallas.